The nursing profession is booming across the US, including the state of Colorado. The Colorado Department of Labor and Employment reports 5,563 LPNs worked in the state in 2014 and by 2024, that number is expected to grow to 7,427. Reasons behind the increase in demand for LPNs include more healthcare services for an aging baby boomer population, a rise in chronic conditions, and higher numbers of insured individuals and families due to federal healthcare insurance reform. The potential for more nursing employment opportunities in Colorado makes it an ideal time to enroll in one of the state’s LPN programs. These programs usually take one to two years to complete, after which practical nurses can find work in a wide variety of medical settings across the state, including hospitals, doctor’s offices, and nursing homes. Read on to learn more about Colorado’s LPN programs, state licensure requirements, and LPN salary and employment. Those who are ready to start working towards their LPN career should start searching for a state-approved LPN program to obtain the required education and training. In Colorado, LPN programs are typically offered at community colleges, private institutions, and vocational schools. The following search tool can help users filter their search based on individual preferences. Prospective students can also select their top choices for a side-by-side comparison of what each school has to offer. Although all practical nurses must undergo the licensing process to qualify for employment, the requirements can vary by state. This section examines the licensing process, including renewals, in the state of Colorado. LPNs must complete a nursing degree program approved by the Colorado State Board of Nursing. Those who have graduated from an out-of-state nursing school must have completed a program approved by that state. Official transcripts must be submitted to the Board as evidence of successful completion. Immunizations and drug testing are both included in Colorado LPN programs. Continuing education is not required by the Colorado State Board of Nursing for renewal. LPN licenses must be renewed every two years on September 30. A delinquency fee of $25 will be enforced for late renewals (October 1 to November 30). Failing to renew a license within the 60-day grace period will result in an expired license. LPNs with an expired license will be ineligible to practice until paying a fee and becoming reinstated. Inactive LPNs must also go through the renewal process and pay the appropriate fee. If licensure has lapsed more than two years, the applicant must demonstrate competency and may be required to complete remedial or refresher courses. Salaries for LPNs are higher in Colorado than the national annual wages, but certain regions will experience higher salary potential than others. The following charts outline the areas of Colorado where LPNs earn the highest salaries. According to the Colorado Department of Labor and Employment, the number of LPNs in the state is expected to grow 25 percent from 2012 to 2022, which equates to 1,774 new jobs. Larger metro areas such as Denver, Colorado Springs, and Fort Collins will experience higher employment growth compared to smaller areas such as Grand Junction and Pueblo. This site includes information on the licensing requirements for LPNs, including application forms and documents. Other helpful information for current and prospective LPNs includes an online checklist for the examination and license reactivation guidelines. CCNE advocates for excellence in all nursing professions including LPNs. The site offers member access to courses and details about special nursing initiatives. This Department regulates nursing laws such as the Nurses Practice Act, which states rules for LPN students. Visitors can access the full version of the Nurses Practice Act from this page. Colorado Mesa University publishes a copy of the Colorado Nursing Articulation Model on this page. It is a statewide model that enables LPNs and other nurses to advance their education more easily through public, private, and proprietary nursing programs. NAPNES promotes and defends the practice, education, and regulation of Licensed Practical Nurses (LPN), Licensed Vocational Nurses (LVN), Practical Nursing Educators, Practical Nursing Schools, and Practical Nursing Students. Its members span the United States, including the state of Colorado. This page explains the Nurse Licensure Compact, a multi-state licensure program open to LPNs in Colorado and other states. LPNs that become licensed in Colorado have reciprocity in these other participating states. This LPN association supports the needs of nurses by providing continuing education opportunities, lobbying services, and an annual convention. 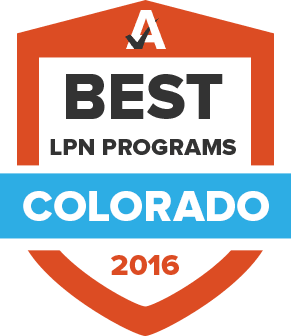 NFLPN is located in Colorado Springs, CO.
NONPF is devoted to promoting quality nurse practitioner education at the national and international levels. The organization represents a global network of NP educators, including professionals located in Colorado. All of the approved programs offered for LPN students in Colorado are located on this page. It is published by the Colorado Department of Regulatory Agencies.